propel conversation: a new geometry for serendipity. The art of starting a new conversation is delicate so we made a table that gives people a chance to feel comfortable in their own domain with an unprecedented closeness to others. 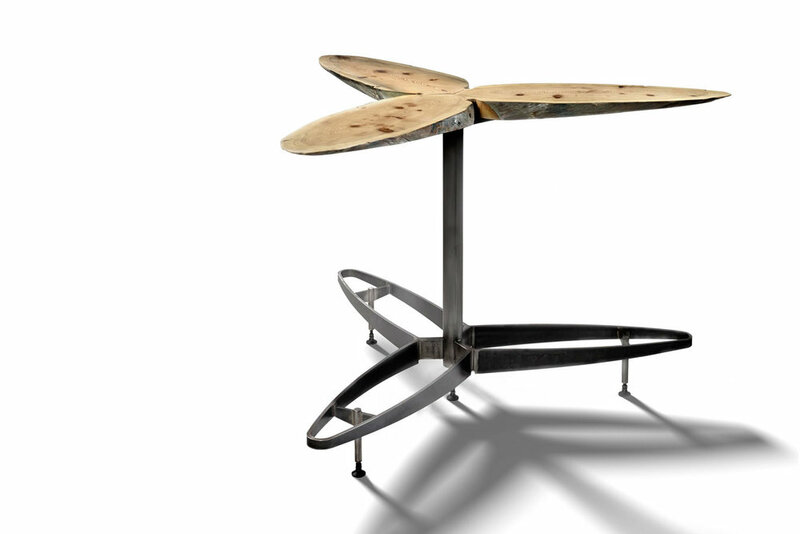 Our conversation propeller table gets people bumping into each other in a way no other table can. The individual petals create discrete territories with ideal proximity and eye contact-ability. For the first time, initiating conversations between any two people is possible regardless of your position at the table. Individual conversations at each petal can easily merge toward the center or spread around the perimeter. This new geometry for conversation catalyses serendipitous interaction through proximity and face to face alignment. Bar height prioritizes fast, walk up experiences. Foot rail keeps you comfortable while you perch. Ask us about material options for top and base or for outdoor use.